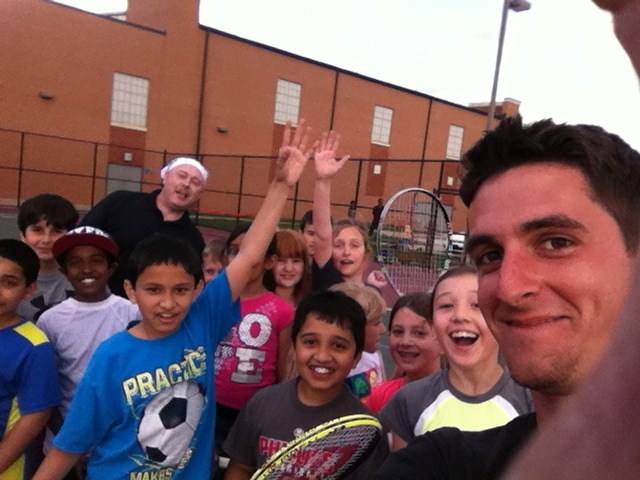 It was a beautiful day for tennis on Saturday, May 17, and everyone came out with their game faces on! Those who were new to match play were ready to try it out, and those who have a little bit more experience were excited to get back on the court and play competitively, representing their team. Practice Court: When players aren’t involved in matches, they will be playing on a practice court, which is usually run by one of our junior instructors. On the practice court, the players will get to play some fun tennis themed games, such as “jail” and “king of the court.” If the players are confident in their scorekeeping abilities, we may send a few off to play exhibition matches on their own as well. Exhibition Matches: Once all the required team matches are completed, if we have some time to spare, we put out some exhibition matches. These are supervised by the coaches, and allow the players to get some valuable match experience in both singles and doubles. At first doubles, Jonathan and Geoff played well for the Blue Dolphins in a match supervised by Coach Greg. They took it home, winning 4-0 against Joseph and Nathan, who got into some good rallies. Second doubles was a close one. In this matchup, Ayush and Sarah of Yellow narrowly edged out Geoff and Roshni (sub from Lionville) 4-3. The singles matches both consisted of quality points in this matchup. At first singles, Jonathan (Blue) defeated Nathan (Yellow) by a score of 4-2 and Ryan R (Yellow) defeated Roshni by a score of 4-2. At first doubles, Shyam and Hunter (red) played some energetic, enthusiastic tennis, defeating Riley and Christian of the Lime team by a score of 4-1. Another close battle at second doubles here. Maddie and Ryan (red) edged out Colin and Cameron of Lime 4-3. In singles, Colin and Ryan F hustled all around the court, engaging in some entertaining rallies with Colin of the lime team having the 3-1 lead at stoppage time. At second singles, we had Maddie and Christian played out some points and get started, but they weren’t able to get a game in due to time constraints, so we’ll leave this one as a tie. At first doubles, Katie and Ruby of the yellow team(who played together this winter at ACAC) came out on top, winning 7-2, 7-3 against Gabriella and Jordyn of the blue team. At second doubles, the Yellow Lions won by default since blue was missing a few players. Second singles was very close as well. In this matchup, Lily of the yellow team barely won against Gabriella (who put up a great fight) by a score of 7-6, 3-7, 7-3. First doubles was a a fun match to watch. Coach Greg supervised this one, and it saw 4 athletic young players going head to head. Teilo and Aarav (Lime) narrowly edged out Faizaan and Finn (Red) by a score of 7-4, 4-7, 7-6 in an entertaining display of tennis. The second doubles match had some great points as well, with the sister due of Hailey and Sidney from the lime team defeating Laila and Paige of red 7-5, 7-3. At first singles, Aarav of lime defeated Finn of red in 2 tight 7-4, 7-4 sets, and at second singles (and yet another close match), Sidney of the lime team just barely held on to defeat Paige of the red team by a score of 6-7, 7-5, 7-4. This is our largest PATTA West Chester group, and everyone always shows up excited to play. We play this division on a 60 foot court with orange balls slightly lower in compression to ensure quality rallies and a solid base for constructing points. Here is some of the action from these matches. Sebastian and Howard started things off strong for the yellow team at first doubles, earning a 4-1 win over Adil and Travis. At second doubles, Morgan and John of the yellow team played well in their 4-0 win over Kiera and Teagann of blue. Blue struck back in singles, though, with Jaden earning a 4-1 win over Amaan at #1 and Travis earning a 4-1 win over John at #2. Those singles matches sure made this a close one! Josh and Akanksh got a solid doubles win (which they were very excited about) against Owen and Zach, earning lime the win for this round. At second doubles, Smita and Alexandra were steady in their 4-1 win over Angelo and Isabella, keeping things close and giving red the win for this one. Again, it all came down to singles, and the lime team came to play. At first singles, Bala defeated Kai 4-0 for lime and Emma defeated Alexandra 4-1 for lime as well. As the day went on, I noticed more and more consistency from all players. Great job to everyone who came out and played in their first matches this past weekend! We’re looking forward to seeing you all improve in the remaining weeks. Remember, we’ll have practice this Saturday, 5/24, and then we’ll have matches again on May 31, June 7, and June 14. Looking forward to the rest of the season! Here is an action shot from the first week.